It seems that there is a never-ending train of celebrations in Penang. 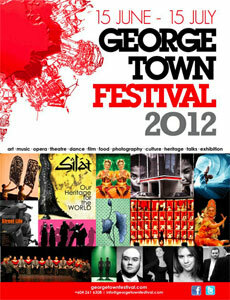 It intensifies in the middle of the year, with the George Town Festival spanning between June and July. Not only locals are involved, there are many of those who share the artistic passion from other parts of the world coming to this beautiful island to show their talents, motivating hundreds, if not thousands, to follow suit each time. 2012 is no different, except that it has become even better this year. The few main categories of the festival are Art, Theatre, Opera, Dance, Film and Music. There are more, of course, and the variety richness guarantees to satisfy the hungry demand for a worthy performance. This year, local and foreign artists and performers of international standards promises an impressive month for everyone. Some of the highlights for this year's George Town Festival are Silat – Our Heritage For The World, Blinded Mind, Live Heritage, The Manganiyar Seduction, and Tropfest. These performances are worthy of mention because they do bring forth art in a different level. Silat – Our Heritage for The World is the opening gala performance on 15 June at Fort Cornwallis, 8.45pm onwards. The martial art is a majestic display that originated some 2000 years ago. The performance will become the result of a collaboration between award-winning producer and director Saw Teong Hin, music director Saidah Rastam, production designer Liew Kung-Yu, lighting designer Dorothy P'ng and choreographer Aida Redza. 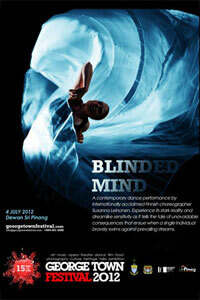 Blinded Mind is a theatrical dance piece with six dancers expressing the themes with their flexible and beautifully choreographed movements. Visual and sound elements complement the dancers grace in a tale of “unavoidable consequences that ensue when a single individual bravely swims against the prevailing stream”。The piece is choreographed by Susanna Leinonen, the renown Finnish choreographer who owns the Susanna Leinonen Company. Live Heritage can be seen along the streets of George Town from 6th to 8th July as a three day celebration with more than 20 cultural performances and showcases. There are guided city tours, heritage talks, food bazaars... activities that will reveal the three Outstanding Universal Values of George Town as a World Heritage Site. The Manganiyar Seduction is a must see performance during the George Town Festival. The performance was hailed by The Straits Times reporting as a “Gala show fit for a king...” during its performance at the Dublin Theatre Festival, as the Indian troupe uses unconventional methods to unveil their musical pieces in ways that keeps the audience interested. The performance is a combination of contemporary theatre with the traditional Rajasthani music, and is said to be once a performance for Rajasthani kings and a worship to Muslim saints and Hindu goddesses. Tropfest ends the festival on 15th July at Penang Botanical Gardens. It is the world's largest short film festival, first establishing itself in Sydney, Australia in 1993. Tropfest had screenings in New York, Las Vegas, Abu Dhabi and many other prestigious venues, and this year's screening in George Town puts the heritage site in par with these other international venues. Besides these highlighted performances, other not to be missed performances include “When 0 Meets 1”, a tribute to the most important playwright in Chinese theatre, Kuo Pao Kun; Penangites' Homecoming Concert which features a host of Penang-born singers, musicians and conductors; Wushu Madness II - The Realm Between which is a combination of contemporary dance and Wushu, a traditional martial art; Rasa Sayang, a series of dance productions which combines eastern spiritual theemes with contemporary visual architecture, a work of Tony Yap, Tim Humphrey, Madeleine Flynn, Naomi Ota and Ben Rogan; and The Philippine Madrigal Singers (Concert), featuring one of the world's most awarded choirs that have made their name in Europe and winning top prizes worldwide. There are a lot more that the George Town Festival has to offer, and this year is certainly better than the last. It got students involved with their own inter-schools annual competition, art exhibitions in various art galleries in the island, the masses interest in a line dance for the public in Esplanade, and Golden Screen Cinema's participation in screening a variety of French Films with the Alliance Francais KL for a French Film Festival. Indulge your senses in the George Town Festival this year, for an experience that you will always remember. For more information, please visit Georgetown Festival 2012. This entry was posted in Tourism & Leisure and tagged Blinded Mind, Georgetown Festival, Georgetown Festival 2012, The Manganiyar Seduction, Tropfest by admin. Bookmark the permalink.